Building a community through positivity! The Forward Cards are designed to uplift, inspire and motivate those who receive one. Each card can be kept as a constant reminder or passed along to the next person that can use a ‘pick me up’. The genesis for The Forward Cards came when creator Carlos (Los) Espada begin to receive e-mails about how the words in his blog and social media posts have helped others get through dark times. When he mentioned this to friend and fellow creative Tony De la Rosa, the two started exchanging ideas. “I once had this idea to make cards I would carry around and give to people just to let them know they did something well, such as a waitress who provided great service, or someone who might otherwise feel unappreciated” De La Rosa said. “I love that idea!” responded Espada, and that’s how Forward Cards came to be. To Espada and De La Rosa, The Forward Cards concept goes beyond the cards themselves, and is more about community; a way to uplift one another and remind people they are not alone. 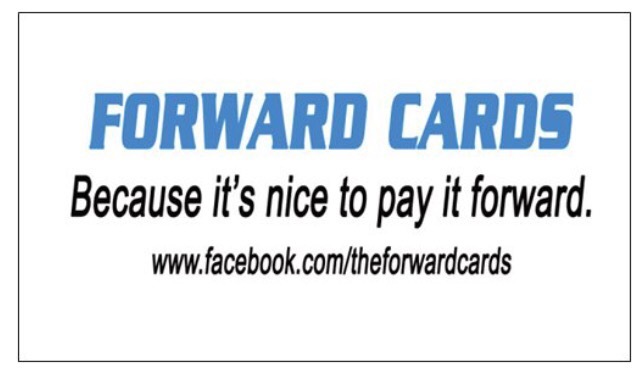 It all starts with a simple act of kindness and maybe a Forward Card.